Location: Topanga State Park, between Malibu and Santa Monica. From Santa Monica, take the Pacific Coast Highway and turn right on Sunset Boulevard. Go half a mile on Sunset, take a left on Palisades and go 2.4 miles and take a left on Vereda de la Montura. Park at the end of Vereda de la Montura and enter the trail through the gate. 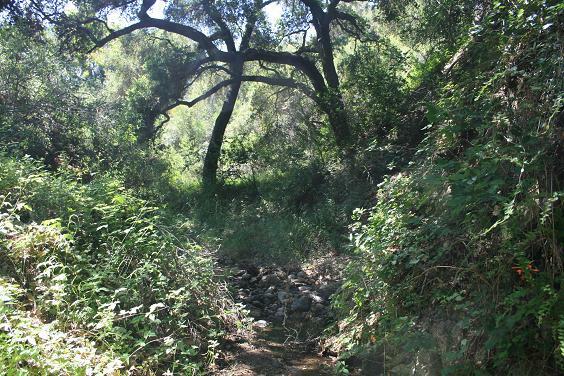 Santa Ynez Canyon is best known for its seasonal waterfall, but the Santa Ynez Trail can also serve as a nice back-entrance to Topanga State Park. 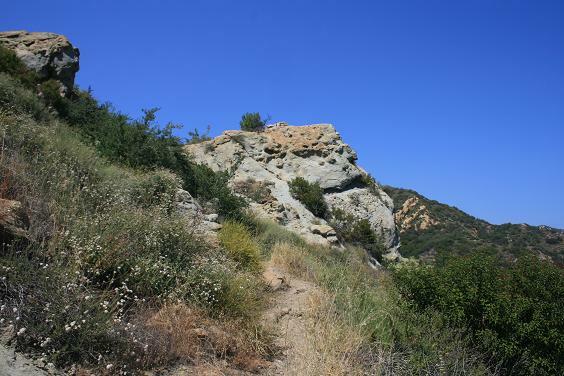 The four mile round trip, which starts in the canyon and climbs above to take in some of the area’s trademark ocean views and sandstone geology, is a good workout in and of itself, but it can easily be extended once you arrive at the Trippet Ranch area of Topanga State Park. Start on the Santa Ynez Trail as if you were going to the waterfall, but at half a mile, at the junction, head left instead. You enter a peaceful, shaded grotto filled with live oaks and a seasonal stream – but as you enjoy the scenery, be careful of poison oak. At about a mile from the start, the trail makes a hairpin turn to the right and begins climbing. You leave the canyon floor and follow a ridge, which ascends steadily. At one point, the trail climbs 250 feet in less than a quarter of a mile, but you are rewarded for your efforts with nice views on all sides. As you make your way higher, your job is made somewhat easier by some shade trees, and a few wooden steps set into the ground. At two miles, you arrive at a junction. Head right, soon reaching the Eagle Rock Fire Road. Here, you can enjoy nice views of the Trippet Ranch area of Topanga State Park, and on clear days, you can see deeper into the Santa Monicas and the Santa Susanas. This marks the turnaround point, but if you have time and energy, you can easily extend your trip to Eagle Rock by heading uphill to the right, or to the Trippet Ranch parking lot, by heading left. Great report. I love taking this route up to Eagle Rock for a longer hike. There are some cool caves along the trail too, after you pass the waterfall junction. Thank you! Yeah, it’s nice to be able to combine the various Topanga trails. There are certainly many possibilities.